Hello once again, I’m back with this month’s part of my Crónica review series. 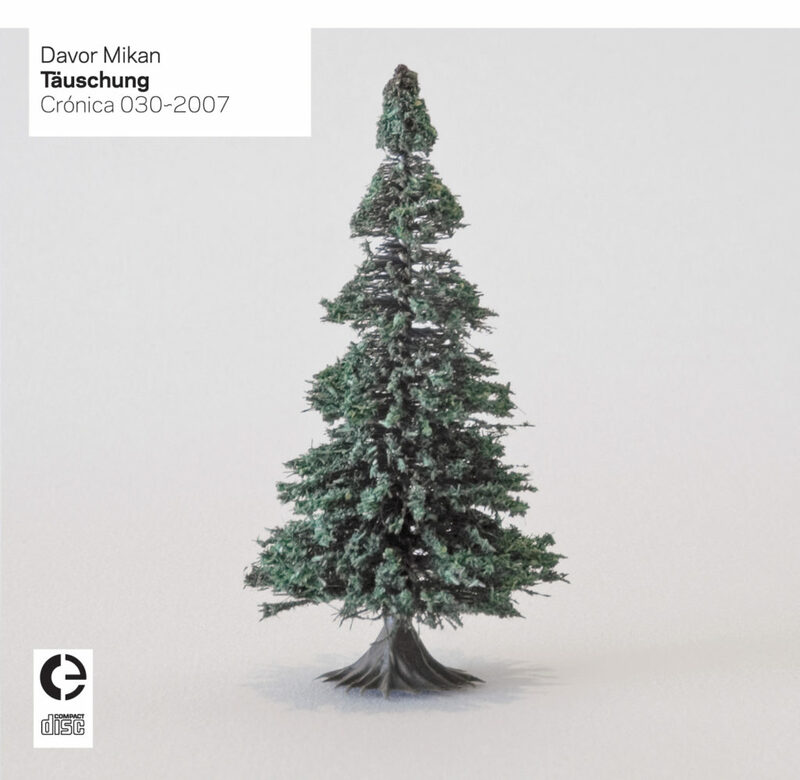 This time I got for you this album by Davor Mikan titled Täuschung, released in 2007. The 31 track album has a running time of only 38 minutes but is definitely packed with fun minimalist electronic experiments and glitchy goodness. This CD is housed in a clear jewelcase with tracklist and credits listed on the back as well as an 8 page booklet that features photos of various evergreen and other quirky looking kinds of trees in different colours, similar to the Christmas tree on the front cover, really fun little addition to the musical content of this release. Now, Täuschung definitely reminds me a lot of the approach in composition to Further Consequences of Reinterpretation by Paulo Raposo & Marc Behrens that I reviewed earlier. Here we also have 31 tracks that are mostly very short bits, less than a minute long and most of them vary in sound material from track to track, the sounds on here are often glitchy, minimalist and subtle. Not entirely lowercase really, but rather soft most of the time. Unlike the aforementioned album however Mikan’s sounds are more distorted and a bit more abrasive and humorous at times. Most of the album consists of bursts of glitches, Noise and various mangled sounds, sometimes synths, sometimes guitars or manipulated vocal sounds. It’s not an album that really wants to sound “logic”, rather it jumps from track to track, always giving us a new burst of weird quirky sounds that are most of the time abstract, crushed and distorted. The album’s structure in terms of pacing of the pieces is rather curious as while many tracks jump from one to the other, there’s sometimes some silence in between them. This album does feel like one big piece of music in that sense, with all different parts being connected in some way, but how exactly is definitely completely up to the personal interpretation of the listener as Mikan definitely never gives you clear guides as to a pattern or recurring theme. This completely freewheeling approach does result in an always suprising collection of tracks however and while the abstract nature and short lengths of the tracks make for a listen that feels pretty odd and perhaps unclear, the completely off the wall and jumping sound of the album is always fun and original, rarely recycling sounds from earlier on and always going in a different direction. An album to replay many times to uncover more sounds from its exciting mixture of constantly changing sounds and textures. Amongst the many short tracks there are a few longer piece however that I’ll discuss a bit now. The first of these is Schon halb verwest which features some sweet Noise manipulations, strange harmonic tones and manipulated guitar as well as some sudden burst of percussive noise in the right channel. It sounds a bit like a degenerated electro-acoustic piece taken from a heavily corrupted file, mad but cool music. Dunkelnder is pretty quirky with its many pitch down / pitch up speed effects, mechanical, whirring sounds and also, typewriter sounds as well as a typewriter bell sound that made me laugh a bit while listening to this piece. This track does have some melodic fragments in the beginning put through Vocoder but most of the track is really based around mechanical sounds, synth and speed manipulated sounds and resonances. Wild piece, but very fun too. Ein Tag is the piece on here that is the most melodic (relatively speaking), with a simple two note pattern droning in the background, that sounds a bit like a mangled electric organ, combined with a tumbling glitched guitar pattern. This gets combined with an ever more crazy growing haze of chaotic noise and screeches until the climax at the end, really wild and intense, nice one.